This post was originally featured in Working-Class Perspectives: Commentary on Working-Class Culture, Education, and Politics, affiliated with the Kalmanovitz Initiative for Labor and the Working Poor at Georgetown University. Allison L. Hurst is an Associate Professor of Sociology at Oregon State University and the author of two books on the experiences and identity reformations of working-class college students. In a recent unpublished paper, Larry Bartels (author of Unequal Democracy) and Kathrine Cramer (author of The Politics of Resentment), reported a finding sure to surprise many who have been blaming “the white working class” for the election of Trump: “Contrary to much recent speculation regarding the political impact of long-term income stagnation, we find a strong correlation between upward economic mobility and increasingly conservative economic and political views.” Go figure. The party of greed, glory, and devil-take-the hindmost appeals to those who have moved upward? Given my own interest in social mobility and working-class politics, I wondered how this finding applied specifically to working-class people. Too often we ignore social trajectory when we talk about class (when we even do talk about class!). It is as if people are fixed in place, like museum pieces, but in reality, people’s positions and situations change over time. They are also influenced by parents and grandparents whose stories and values they embrace or reject as they make their way through life. How might working-class people’s class identifications and loyalties affect their political choices? We all know that there are workers who identify with the working class, who work in solidarity with their fellow workers, who seek to advance their interests as a class,while others identify with the boss and seek to advance their interests on their own. Traditionally, foremen (and they are more often men than women so I am keeping the archaic nomenclature), who stand in a contradictory location betwixt workers and owners, have embraced bossism, a term I am coining here to mean identification with the boss through disciplining of other workers. They are like Fer, the sadistic prisoner in Solzhenitsyn’s One Day in the Life of Ivan Denisovich, who takes the side of the camp guards and is trying to rise to the position of engineer at the construction site. Or like “Yock,” the evil foreman who Jack Metzgar describes as getting into interminable duels with his father and other workers on the line in Striking Steel. Like prison guards, they work for the master. They are trained in cruelty and rewarded for being hard on everyone else, including those who look like them but especially those who don’t. I am sure there are many good and kind forepersons out there, but most enterprises that run on fear and intimidation need the unkind kind. Anyone knowledgeable in history knows that capitalism thrives when it keeps workers in line. Is it possible that the candidate who promised tax cuts for the wealthy and strong discipline for the unruly appealed particularly well to foremen and supervisors among the working class? Could workers who vote Republican be, well, tools of the master? And so I turned to the General Social Survey (GSS) to see if there was something going on with this. And I found some interesting patterns. But first, let’s consider the white working-class’s supposed swerve to the right during the Reagan era. Many did turn away from the Democratic Party in the 1980s, but only to a point. Where most used to vote Democratic pretty regularly, they are now about evenly split, including many independents. Equally important, the move to the Republican Party was greatest among the group of workers I call Builders (mostly construction trades), a category that includes a pretty high proportion of foremen. If we look only at white working-class men, who may be especially prone to bossism, we find even greater differences, not just between those who voted Republican and those who voted Democrat, but also those who did not vote at all. White working-class men are (a) more likely to vote Republican if they identify as middle class and (b) less likely to vote at all if they identify as working-class, lower-class, or poor. These are men in the same job categories. (ANES) data from the primaries lets us factor in income. Among workers whose household incomes fell below $75,000, those who identified as middle class were twice as likely to have voted for Trump in the primaries and half as likely to have voted for Sanders. Why might some people regard themselves as middle class and others as working class? Some say that people just don’t understand class in the US, so “most” people identify as middle class. But this is a condescending simplification. Class is not merely an objective social position, defined by occupation and power, but also something relational whose contestation can take the form of identification. In other words, by claiming middle-classness, workers can identify with the winning side against other workers. And, vice versa: by claiming working-classness, workers can align themselves with the collective struggle against the bosses. This is not simply a matter of class consciousness, but of where one wants to align oneself. I found some evidence of this in earlier GSS data on workers’ identification with the industries they worked for and whether they disciplined other workers or took part in other tasks of worker control (such as scheduling). In all those cases, I found a strong correlation between these elements of bossism and voting Republican. Identifying with the boss and identifying as middle class appear to have a multiplier effect on voting Republican as well. For example, 71% of MC-identified White Working-Class men reported disciplining other workers, and 80% of such men agreed with the statement that they work more than their fellow workers. Today many see workers (especially white men) embracing candidates and policies that seem to have little to do with working-class solidarity. Workers are no longer automatic votes for the Democratic Party. 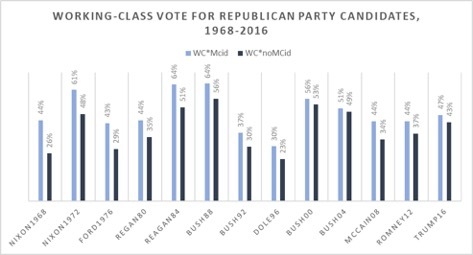 The more privileged classes don’t always vote Republican (indeed, highly-educated professionals are now the backbone of the Democratic Party). Instead of boss and workers, the divisions today may appear to reflect cultural rather than economic divides: Red State/Blue State, old/young, racist/globalist, Christian Fundamentalist/everyone else. But the data I presented here suggests that class still matters. We just have been paying too little attention to the importance of class realignment and allegiance. Within all classes, those who earn more, particularly as a reward of supporting and enforcing the system, are more likely to vote Republican. Working-class foremen, thinking that they are better than the workers they police, embrace the Republican Party’s mean-spirited Trumpism, as do the very rich, who are jealous of their privileges and threatened by the highly educated. In every class, Trump draws from those who believe in a game of winners and losers rather than a world of justice and solidarity. The sad thing is that, as our workplaces get meaner, the mean-spirited will have even more people to draw from. Most Americans are working class, but as I have argued previously, they do not all share the same experiences, values, or beliefs. And they do not all share the same politics. We cannot hope for justice to emerge out of a beaten-down isolated working class, and the decline of unions means we have lost one of the great training grounds for working-class solidarity. Revolutions have only been successful when workers come together to recognize their shared interests and common enemies. We will need the foremen on our side, too. So we have a lot of organizing to do. Did this article whet your intellectual appetite? Check out some other posts that may also be of interest to you. Like many of my friends and colleagues who study class and are worried about the increasing economic inequality of this country, I was at first overjoyed that the recent presidential election would force us to reckon with the subject of class. Usually ignored, working-class people were now becoming subjects of a national conversation.